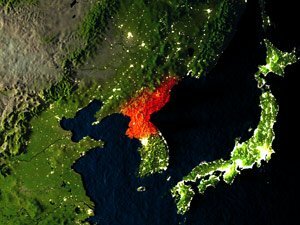 The Dow Jones news today is focused on North Korea's latest missile launch that flew over Japan last night. Dow Jones futures are down 104 points in pre-trading hours as traders try to make sense of the latest threat from North Korea. U.S. President Donald Trump responded to North Korea's missile launch this morning by saying "all options are on the table." Gold prices were on the rise this morning – passing $1,313 per ounce – as stock traders fled to safe-haven assets. Look for the CBOE Volatility Index (VIX) – largely considered the markets' fear gauge – to spike in today's trading session. While the problems in the Korean Peninsula continue to mount, there is a different crisis here in the United States. Hurricane Harvey continued to cause serious problems in Texas, and flooding in Houston is wreaking havoc on the nation's fourth-largest city. Exxon Mobil Corp. (NYSE: XOM) announced that one of its key refineries in the region was badly damaged and that chemicals could leak out. Reports indicate that the monetary damage from the storm will range into the billions. Insurance stocks are falling again on Tuesday in the wake of Hurricane Harvey. According to a report from JPMorgan Chase & Co. (NYSE: JPM), we could see insurance companies like Chubb Ltd. (NYSE: CB) and The Travelers Cos. Inc. (NYSE: TRV) on the hook for about $20 billion in total losses. Who Is Uber's New CEO? We are learning more today about Uber's decision to hire its new CEO, Dara Khosrowshahi. Uber is hiring the current head of Expedia Inc. (Nasdaq: EXPE). The ride-sharing giant has been seeking a CEO since the resignation of founder Travis Kalanick in June after an investigation into the culture of the company. Khosrowshahi has headed Expedia since it was spun out of InterActiveCorp. (NYSE: IAC) in 2005. Shares of Best Buy Corp. (NYSE: BBY) were flat after the company reported second-quarter earnings before the bell. Wall Street anticipated that the company would report earnings per share (EPS) of $0.63 on top of $8.66 billion in revenue. The company beat both figures easily; however, broader concerns – particularly North Korea – are weighing on all stocks this morning. Amazon.com Inc. (Nasdaq: AMZN) is generating a lot of attention after the company took a huge step in shaking up the U.S. grocery business. Following its acquisition of Whole Foods Market Inc., the firm slashed its grocery prices by up to 43% on Monday. This is a signal to the rest of the industry that Amazon will use its size and financial scale to undercut competitors in the space. Shares of Merck & Co. (NYSE: MRK) were falling despite positive news about a key cholesterol drug in its pipeline. The firm reported that an experimental drug could reduce the risk of heart attack by a whopping 9%. Though the drug has not been approved, the company has not said when it will file with the U.S. Food and Drug Administration or regulators in other markets. Look for additional reports today from H&R Block Inc. (NYSE: HRB), Ollie's Bargain Outlet Holdings Inc. (Nasdaq: OLLI), Caleres Inc. (NYSE: CAL), AeroVironment Inc. (Nasdaq: AVAV), Movado Group Inc. (NYSE: MOV), NCI Building Systems Inc. (NYSE: NCS), ScanSource Inc. (Nasdaq: SCSC), and Jill Group Inc. (Nasdaq: JILL).